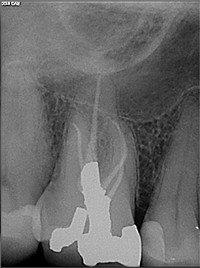 The fees for your endodontic treatment are based on the extent and complexity of your case. During your consultation visit we will discuss the probable number of visits, their length, and the fees involved. Endodontic fees usually range from $900 to $1,600. Recent discoveries in microbiology indicate that the types of infections we treat in teeth and gums are exceedingly tenacious. While we are always searching for better treatment protocols, the most predictable approach for many cases involves treatments over 2 or more appointments. We charge half of the fee to start treatment and half to complete (usually one or more months later). If treatment is completed in a single visit, the full fee is due at that time. Because of the specialized nature of care at Weed Endodontics, Dr. Weed does not sign contracts with third parties and allow them to dictate terms of treatment. If you have dental insurance, we will gladly do the work in submitting the claim for you. You will find that the treatment and care you receive at our office is different than just about anywhere else. We take pride in being thorough, honest and uncompromising. There are many options out there for dental treatment and we appreciate that some patients may choose a lower level of care at another office to satisfy the demands of an insurance carrier. However, our committment is to provide the highest level of care available in the world. 3D imaging is a relative newcomer to dentistry. This technology can provide invaluable information about your case when indicated. We do not scan every case. Many practices charge several hundred dollars for 3D (CBCT) scans and they are certainly worth that. However, you will find our scan fees to be more than reasonable. Dr. Weed will review the scan with you in detail and the value of the information will be clearly evident. Most insurance companies do not reimburse for this type of imaging.